On-Sale Just $3999. WWP-41 $5499. 41 Body w/floor & Front End FWWY-41 $8399. 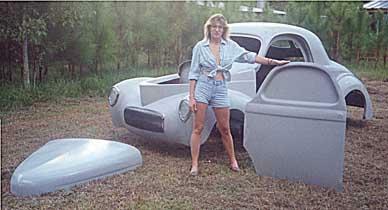 41 Body Shell - no floor WWY-41 $4199. 41 Doors pr. FWWD-41P $ 998. 41 Doors pr. WWD-41P $ 878.
for as little as $50 w / purchase. WWH-41 $ 389. 41 Trunk Lid FWWT-41 $ 699. 41 Trunk Lid WWT-41 $ 389. Installation takes time!! Whether you are installing just the body or an entire package, the bodies must be through bolted to your original frame. - Accepts original hinge, latch & regulator hardware. - Coremat reinforced outer skin reduces "print thru". - 90 edges on both sides help to maintain body contours. - Coremat reinforced skin aids in reduction of print-thru. U.S. Body Source inc. Proudly serving automotive enthusiasts since 1987 © Copyright 1987U.S.Body Source inc., usbody.com, dragglass.com, e-bodyparts.com, etc. The text and images in this and the afore mentioned sites may not be reproduced for commercial purposes without express written permission from U.S.Body Source inc. The use of names and headings is for the sole purpose of identification. U.S.Body Source is not affiliated with GM, Ford, Chrysler or any other vehicle manufacturer. Items ship freight collect. Freight is not refundable. 30% Restocking on all returns. Please Read Our Policies!